Height / Weight: 5’9” / 142 lbs. Physical Description: Francois Vitesse is a skinny, agile young man whose blonde hair is typically slicked back. The tallest of his siblings, Francois stands two inches over the other brothers. Since turning to a life of crime, the brothers have ceased to wear the uniform of the New Vindicators Academy. They have instead adopted costumes of similar fabric: each brother wears a skin-tight, smoke-grey bodysuit that has two black bands that race up the inner arm, dash over the armpit, down the torso and fall over the legs. These costumes include a full cowl that covers the skull and protects the eyes from the rush of wind as they run. Biography: In 1985, the super-sonic jewel thief Marceau Vitesse was brought to justice by two SPBs: the Frenchman’s latest crime had brought him to Holland and pitted him against the Dutch superheroine Bestiary and the Luxembourgish necromancer, Alexander Tharivol. The pair united in bringing the man to justice. Marceau was taken to the Hague and tried by the International Criminal Court. Due to the difficulty in apprehending him over the course of his criminal career, Marceau was sentenced to life in prison. While America had been incarcerating super-powered criminals in Alcatraz, those with had committed international crimes found themselves imprisoned in Pandora, a secret prison with an unknown location. Though Marceau was never heard from again, his family lived on. The middle-aged man had a son almost out of his teens. Ligier Vitesse was in possession of his father’s Neo-Sapien abilities but kept them hidden for fear of disappearing in the manner his father had. Striving to live as normal of a life as possible, Ligier worked as a chef and married Bettina, a claims adjuster for an insurance company. In 1988, before the couple could celebrate their first anniversary, Bettina found herself with child. Weeks later, her doctor revealed to her that she was actually pregnant with quadruplets. Not far into the next year, she gave birth to four boys: Francois, Antoine, Stendhal and Tristan. Francois was always the smartest of the children. Charismatic, he easily coerced his siblings into one plot or another—usually the sort of schemes their parents grounded them for. When the boys were of age, they were enrolled at the New Vindicators Academy of Europe. NEW VINDICATORS: sic simper tyrannis—In 2007, Francois was chosen to lead a team through the Trials. It came as no surprise to anyone that he chose his three brothers. Ultimately, Francois was able to steer them to the Final Trial where they were split up in one-on-one matches. Each of the Vitesse brothers lost their respective fight, with Francois losing to Ark. Height / Weight: 5’7” / 138 lbs. Physical Description: The most lithe of the Vitesse brothers, Antoine wears his blonde hair in a faux hawk and sports a faint scar on the left side of his forehead. This memento from his childhood was received when he was jumping on his bed, fell and received four stitches as a result. Like his brothers, Antoine wears a grey and black costume. He ordinarily allows the cowl to hang behind his head, finding that it messes up his hair. He carries a pair of goggles to protect his eyes as he runs. Biography: Of the boys, Antoine was the first to manifest his powers. When he was only 6-years-old, Antoine discovered his ability to run at staggering speeds. The only thing that kept him from running off was his father’s own ability to move even faster. By the time he was 12-years-old, this was no longer the case: Antoine was now faster than his parent and his siblings. NEW VINDICATORS: sic simper tyrannis—In 2007, Antoine was drafted by Francois for the Trials. Together, with their brothers, they made it to the Final Trial where Antoine drew Jetstream as an opponent. Though easily faster than her, Jetstream proved herself able to use her speed better than he did and easily bested the Frenchman. Michuru81 wrote: Continuing with the Vitesse brothers, we have Antoine. As the fast one of the group, Antoine has two ranks over his brothers when it comes to Super-Speed. He also has the largest trade-off for Defense and his Reflex save hits the ceiling. He takes a hit in the abilities department and proves he's really only good for one thing. With the Vitesse brothers, I wanted to make use of all of the alternate powers Ultimate Power suggests for Super-Speed. Most of them follow a theme: like Francois, who focused on spinning, Antoine focuses on vibration... and Air Control, because... why not? Height / Weight: 5’7” / 140 lbs. Physical Description: Marked by a prominent diastema between his front teeth, Stendhal wears his hair in a shaggy mop he seldom bothers combing. Like his brothers, he wears the same grey and black bodysuit in his criminal career. Biography: Though able to keep the pace of most of his siblings, Stendhal was always regarded as the slow brother. NEW VINDICATORS: sic simper tyrannis—Drafted by his brother, Stendhal was eliminated from the Trials in the Final Trial, when he drew Rush as an opponent. Michuru81 wrote: Look, another Vitesse brother. Who would have guessed it? Stendhal is the one who's not too bright. Oh, sure, his Intelligence is the same as Antoine's but... humor me. Stendhal is the one who didn't learn German while at the school. Stendhal is the one with the least amount of alternate powers. Stendhal is... well, he's just sort of filler. Really, his main contribution is to make sure the Vitesse brothers' initials spell "F.A.S.T." instead of "F.A.T.". Yes, their names were specifically chosen so that their initials would spell "F.A.S.T.". By the way, "Vitesse" is the French word for "speed". Yeah, that's right: I am that lame. Height / Weight: 5’7” / 148 lbs. Physical Description: Tristan stands out as the physically strongest of his siblings. His blonde hair is worn in a crew cut. Tristan’s right ear lays flat against his face. Biography: As a child, an ear infection left Tristan with a perforated eardrum. When the eight-year-old underwent surgery to repair it, brought on inner ear damage. NEW VINDICATORS: sic simper tyrannis—Along with his brothers, Antoine and Stendhal, Tristan was drafted onto Francois’ team during the Trials. Together, the brothers made it to the Final Trial. There, Tristan faced Drake and lost to him. Michuru81 wrote: You know, after posting Francois, Antoine and Stendhal, I was tempted to throw off and post someone random like Libra or Maria's little brother, Santiago Espada. Cooler heads prevailed. Tristan Vitesse is meant to be the balanced brother. Notice how he has taken no trade offs? Notice how he hits his ceilings in combat. Notice the theme of his alternate powers. Tristan is the combat monkey of the group but also... he's the protector. I see Tristan as being like the protective older brother: Francois is a schemer, Antoine is hot-headed, Stendhal is the dimwit... Tristan is the calm, rational one who takes care of his brothers... hence the Interpose. Re: OUBLIETTE 2E: Charybdis, Savateuse, Vitesse Bros.
Yeah, Savateuse definitely seems the coolest of the little group of villains that all decided to pull heists on the same day. Course, I might just be saying that cause she isn't about to pummel Jay and Vik into the ground. Arthur Eld wrote: Yeah, Savateuse definitely seems the coolest of the little group of villains that all decided to pull heists on the same day. Huh. Everyone who beat them in Trials has since died. Ark, Jetstream, Rush, Drake... It almost like they're cursed. Maybe Jay and Viktor should throw in the towel? Nah, Jay's good, at least for a little while. Canon states he won't die until 2009. Unless of course, the Jason seen in New Vindicators #84 is one of his magically-created clones. Belly-aching aside, I really like the Vitesse brothers. Speedsters are both an exciting and daunting concept for me, because the room for power-abuse is really large. But I like how you gave each of them their own niches so they feel like speedster brothers, but also unique characters. Also I'm sure we'll see Charybdis and Amnesia eventually. Denmark's got to have some NS villains, right? Arthur Eld wrote: Nah, Jay's good, at least for a little while. Canon states he won't die until 2009. What makes groups like the Vitesse brothers or the power_gamers work is that they have a means of escape. They hit a place, move fast and leave before the fight comes to them. In the event that Tooth and Nail (Sabretooth-esque brothers) break out of Alcatraz and make their way to shore, it stands to reason that their spree won't last long. That aside, yes, teleportation tends to make these things a little on the crazy side. Especally if they've got some heavy powers to back it up. Height / Weight: 5’6” / 152 lbs. Physical Appearance: Doug has beady eyes, a large nose and short hair. Doug is ordinarily seen wearing a green sweater-vest over a white T-shirt with khaki shorts and red and white sneakers. The numbers 00116 are burned in the flesh of his right forearm. Biography: A gifted writer with a passion for music and a penchant for daydreaming, Doug Droll dreamed of a life filled with adventure. He fantasized about being a secret agent, a martial artist, a Mexican outlaw, cowboy, explorer—even a superhero on occasion. And then his Neo-Sapien powers manifested. For a long time, Doug had suffered at the hands of a bully named Roger. When Roger got his hands on Doug’s journal, he outed the youth as a Neo-Sapien. Before long, the community knew that the mild-manner junior high student possessed super-powers and that information soon made its way to the United States government. In the wake of Senator Amy Bedford’s assassination, Black Box went into action and rounded up any known Neo-Sapiens. The Droll household was invaded. The Drolls tried to fight but were killed in the conflict. Only Doug, who had used his powers to fly away, lived only to be captured later and imprisoned in the internment camp located in Peoria. Fortunately for Doug, a small squadron of New Vindicators breached the dimensional prison and liberated the hundreds of Neo-Sapiens contained there. When given the opportunity to do so, Doug again fled, this time to the New Vindicators Academy of Europe. See, "droll" is a synonym for "funny" as in Doug Funny, the imaginative star of Nickelodeon's (and later Disney's) Doug. The show's titular character was prone to fantasies where he was... well, not an ordinary kid. The main alter-ego he envisioned for himself? 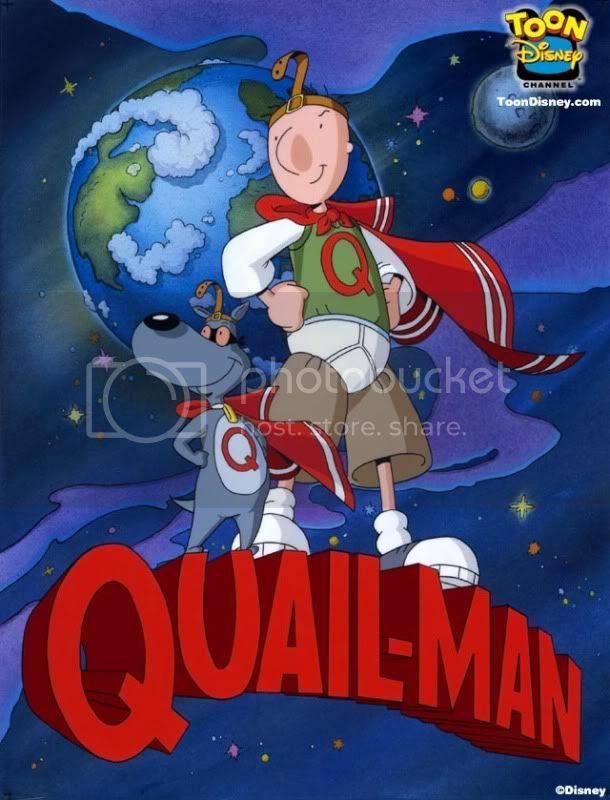 Quail-man: the Last Son of the Planet Bob. The trouble with quails is... Well, if birds played organized sports, quails would get picked last. Quails tend to run and hide. They're known for short bursts of speed but they tend to fly low... hence my Doug's phobia. Right now, Quail is a freshman at the New Vindicators Academy of Europe so... he's not quite matured yet. His ability scores will go up some day and the school will teach him how to fight (and hopefully how to not die) but don't expect his powers to ever really take off from where they're at now. Most importantly? This officially rounds out the current student body of the New Vindicators Academy of Europe! At least... until Venefica and Larrikin join the cast and... until I have to introduce a new freshman class... At which point I'll promptly withhold the stats of whoever Arthur Eld requests for almost a year. ;) It's what I do. Last edited by Michuru81 on Tue Dec 21, 2010 10:07 pm, edited 1 time in total. I love this guy!! I like flying characters with a fear of heights...it's humorous. I know it may not seem like it, but, Doug was worth the wait. Hmmm...now I really regret not making Candyman a diabetic. I hate to be the bearer of bad news but... isn't Doug's family dead? Arkrite wrote: I hate to be the bearer of bad news but... isn't Doug's family dead? Touché. I neglected that I did that to him. Poor Doug. The guy just can't catch a break. Arkrite wrote: Poor Doug. The guy just can't catch a break.